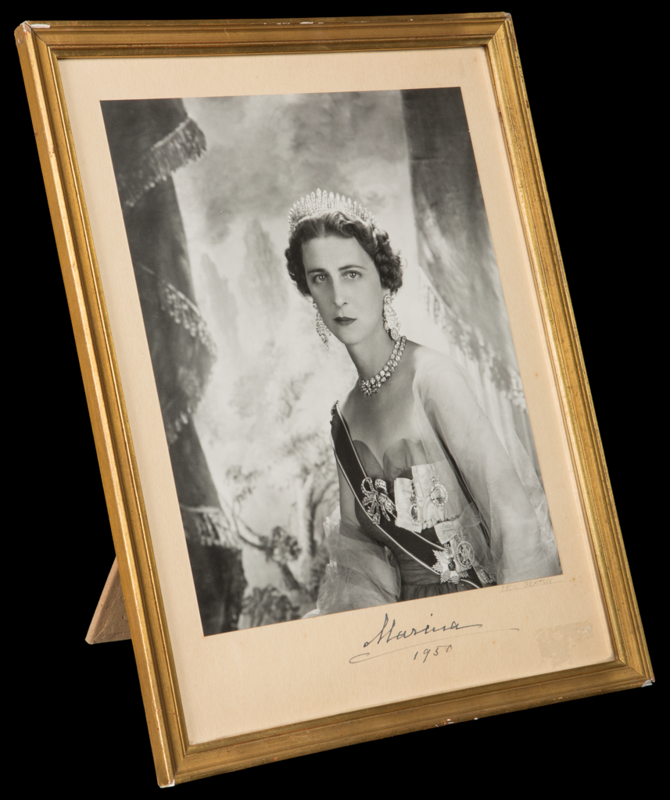 Before Princess Margaret and Diana, Princess of Wales, there was Princess Marina. Marina was the first of a league of fashionable modern royals to live at Kensington Palace. With her chic looks, she managed to stay at the forefront of fashion for over 30 years – from her wedding to the Duke of Kent in November 1934 until her death on 27 August 1968. She knew exactly what suited her, preferring to stick with simple but elegant silhouettes to following fleeting trends. Her guiding principal was always understated, and she looked her best in more informal, relaxed occasions. Marina’s name was repeatedly featured in ‘best dressed’ lists and you could spot her gracing the glossy pages of magazines such as Vogue, Harper’s Bazaar and Tatler. 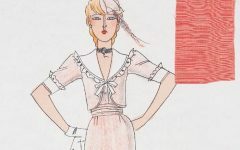 Fashion designers in Paris and London were always eager to dress her- with her tall and lithe figure, she could carry any creation with the utmost elegance! But it wasn’t just designers that found in Marina an inspiring muse. 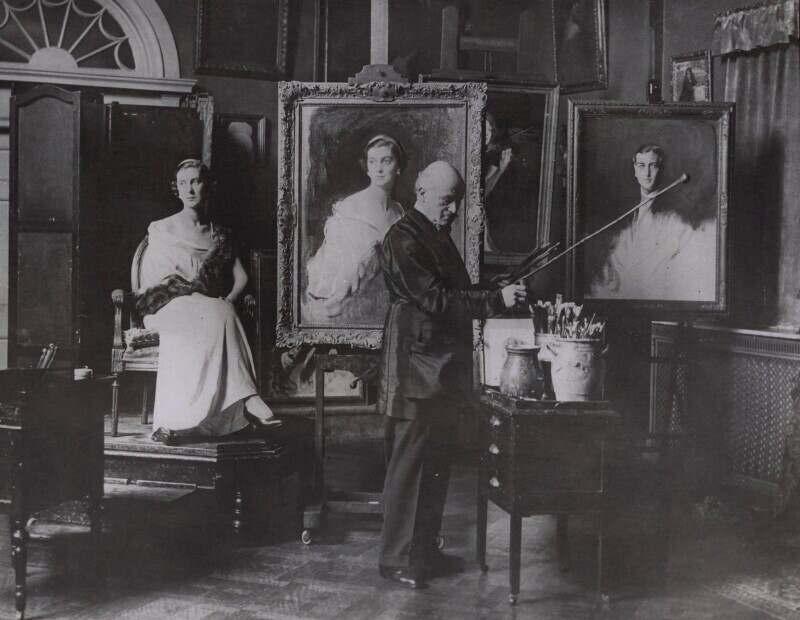 Celebrated photographers and artists were also keen to capture the Duchess’s ‘cool and classical features.’ Throughout her life, she sat for Dorothy Wilding, Horst P. Horst, Harlip and Bassano, and was immortalised by the brushstrokes of Philip de László and Saveley Sorine. From all of her iconic portraits, those taken by all-around creative force Sir Cecil Beaton are my favourites. 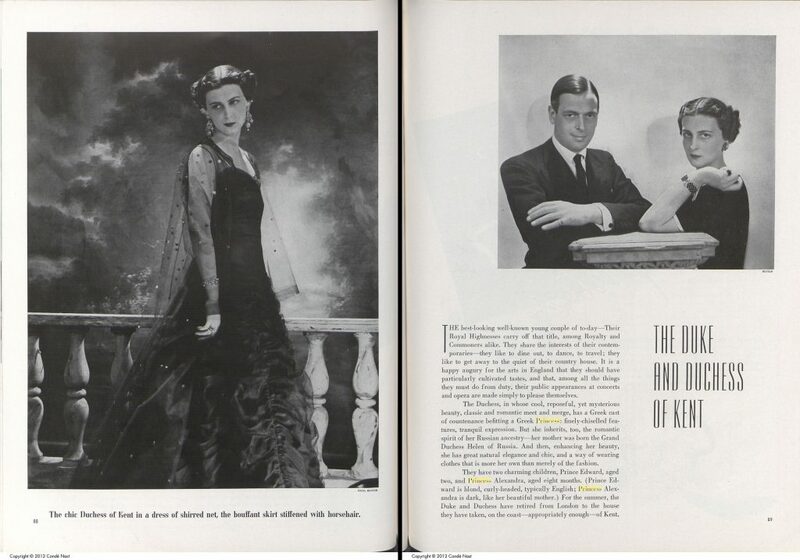 Page of American Vogue featuring Princess Marina. This photo was taken by Cecil Beaton during their first shoot together in 1937. © The Condé Nast Publications Inc. In the following year, the Duchess returned to Beaton’s studio for another photographic session. He noted how she arrived ‘with a picnic lunch-basket and boxes containing Greek national dress and her formal gown complete with orders and decorations.’ It is fascinating that she chose to have an official portrait in her Greek national dress, as it is the only occasion I have managed to find of her wearing it. 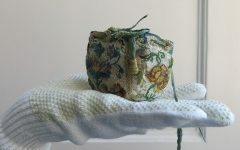 She had brought it with her when she moved to the UK, probably as a memento from her homeland. It comprises a blue silk dress embroidered with flowers (foustani), a deep red velvet jacket embroidered with golden thread (kontogouni), and a red felt cap (fez) with enormous golden tassels. Its style was originally created by Queen Amalia in the 1830s and became known as the Amalia costume. Until then, each Greek community had its own type of traditional dress. Amalia, who had come with her husband King Otto from Germany in 1830, wanted a single national costume to be worn by everybody – one dress for a modern and unified Greece. She combined elements from different folk clothing and mixed them with Western fashion. By the time Marina posed in it, the Amalia costume had long lost its popularity. Very few women wore it, mainly during national celebrations. That Marina had one and decided to bring it to the UK makes it even more interesting! Princess Marina wearing her Greek national dress, by Sir Cecil Beaton in 1938. © V&A Images. 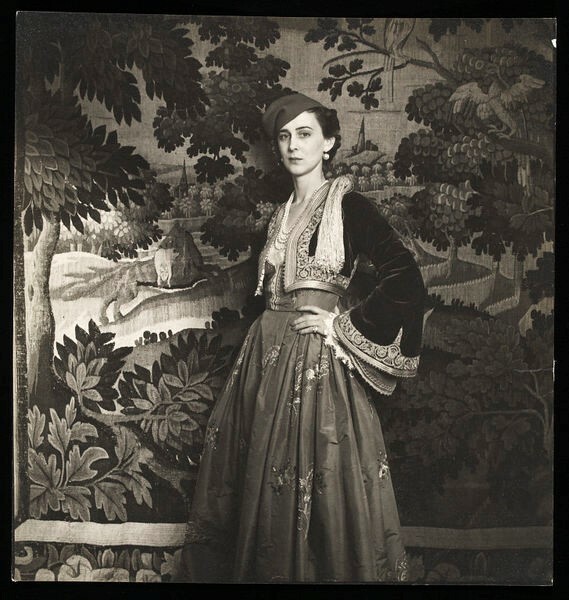 Princess Marina and Cecil Beaton collaborated several times more, forming a life-long friendship in the process. When she passed away, he mourned ‘for people my age the loss is great for she was so much part of an era, and she added so much to the early days. She was always so vividly around, even until now, so that with her going she leaves a very great gap’. In recognition of Princess Marina’s contribution to twentieth century style, we’ve recently acquired two examples of her silk and lace lingerie for the Royal Ceremonial Dress Collection, a treasure trove of around 10,000 items of royal and court dress. Acquired with the support of Art Fund, the black chiffon negligee and accompanying yellow sleeveless nightgown tell us just how fashion-forward Princess Marina was. Predating her marriage to the Duke of Kent, they are in the 1920s ‘Garcon’ or ‘flapper’ style, which is typified by a straight, elongated silhouette and a hemline that was considered radically short. This style was worn by highly fashionable young women, and is often considered a direct riposte to the very curvy, matronly Edwardian styles sported by the previous generation. These pieces also show the value placed on good underwear by Marina’s generation. 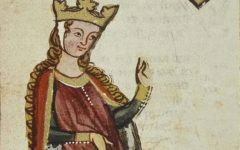 An iconic women – she dies before 50years on August 27th. What an interesting story! Sad that she died so young, but great that she was able to have such an impact on fashion. Really interesting Isabella – a very beautiful and stylish woman I know little about. Hope to see the negligee some time at when I’m at KP.